Here’s something unusual for me to post – not only do I have a vegetarian main dish for you but it uses TOFU! This recipe surely could be made with eggs but you’ll get a much larger serving using tofu, and it is DELICIOUS! Tofu can count as a protein or veggie on our plan! Preheat oven to 350. 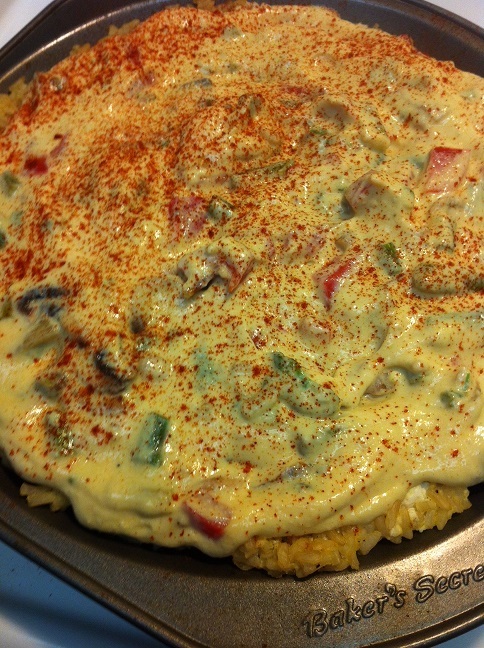 (Set water to boil for rice if you don’t have pre-cooked rice on hand and cook it while you prep the filling.) Put the first 7 ingredients (tofu/eggs through salt) into a blender. Puree until completely smooth, stirring a couple of times between blending. Mix cooked rice with 3 Tbsp of tofu mixture for binding. Add black pepper to taste. 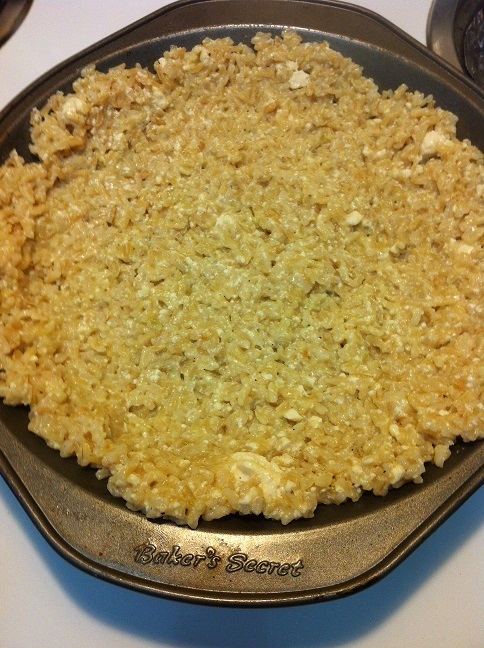 Spray a pie pan with cooking spray, and press rice into the bottom and up the sides of the pan. Bake for 8 min. Remove from the oven. Snap tough ends off asparagus spears and discard. Cut off the top 2 inches and set aside. Chop remaining stalks into ½” pieces. Spray a medium non-stick saucepan with nonstick spray and heat. Add shallots and cook for ~1 min. Add garlic, asparagus, and two Tbsp of water. Cover and cook for 2 min. Add mushrooms, bell pepper, and 2 more Tbsp water. Cover and cook 2 more min. Remove cover, sprinkle with salt and pepper to taste, and cook, stirring, for 1-2 min until most liquid has evaporated. Separate out asparagus tips from the rest of vegetables. 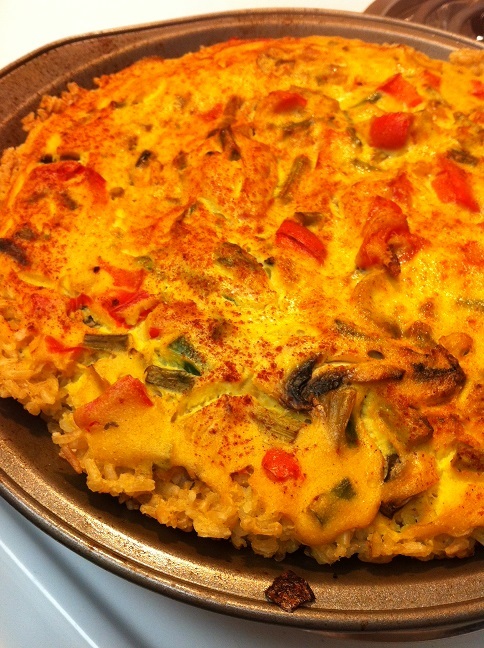 Spread vegetables (excluding asparagus tips) on top of the rice crust. Pour remaining tofu mixture over vegetables, stirring lightly to distribute it through the vegetables. Arrange asparagus tips over top and spray lightly with olive oil. Bake for 60 mins. Let cool for ~10 min before cutting. Makes 4 carb servings and can count as your protein as well. If needed, you could add a separate protein serving with the tofu being used as a veggie. I know, I know. Those of you willing to try tofu are ECSTATIC right now and the rest of you are thinking, “Seriously? !” But I highly encourage you give this a try. You prep and bake once for four carb meals! 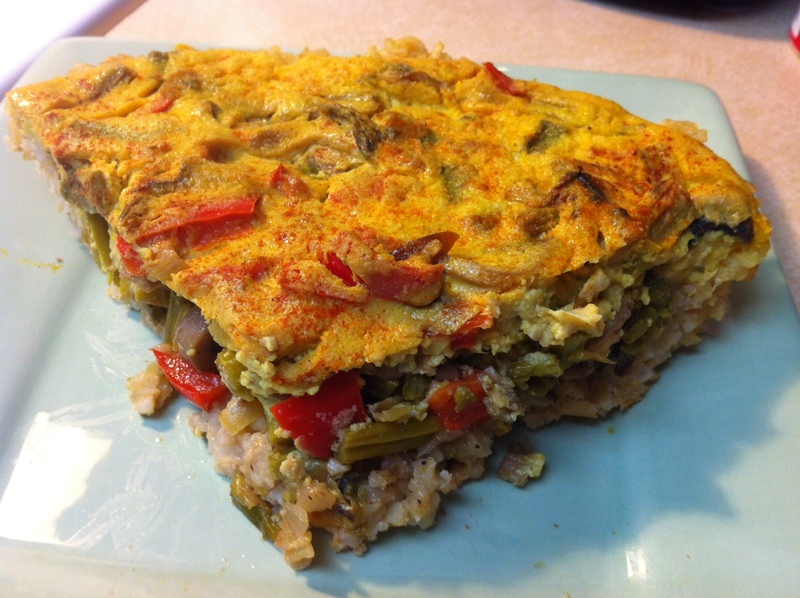 Feast adventurously, feast quichy, and as always…FEAST ON!! !